Kevin’s research focuses upon eyes, sight and the senses, often exploring connections between science and culture. Key areas include cross-sensory transfer between diverse media (such as how the sensory experience of a film can inspire the material form and ‘feel’ of a fashion collection); research focussing upon perceptual and experiential issues within art and design, such as crossmodality, synaesthesia and sensorial empathy; the relationship between the digital and the physical; alternate ways of seeing/sensing, including heightened acuity in particular senses; and creative mapping of the lived environment. Recent publications include the article ‘Eyes, Sight and the Senses on Fashion and in Film’, a review of the Natural History Museum exhibition ‘Colour and Vision: Through the Eyes of Nature’ in The Senses and Society, and the book chapter ‘The Eyes of David Bowie’ in the edited collection Enchanting David Bowie: Space/Time/Body/Memory (Bloomsbury 2015). 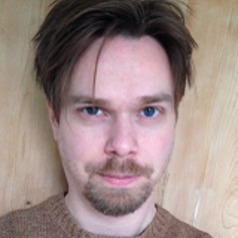 Kevin has also written articles and reviews for numerous publications, including: Afterimage: The Journal of Media Arts and Cultural Criticism; Critical Studies in Fashion and Beauty (with Professor Alison Goodrum); Visual Communication (with Professor Alison Goodrum); Flow: Journal of Television and Media Studies; The Journal of American Studies; The Senses and Society; Material Culture; Eye: The International Review of Graphic Design; Huffington Post; and The Conversation.